The interior of No 9 Henrietta Street has an excellent staircase and hall and can be seen through the courtesy of the Sisters of Charity in the afternoons from April to September. The house was described in some detail in The Irish Builder, July 1 1893 – “This beautiful mansion, built after a design by Richard Castle, the architect of the Parliament House, is, with the exception of Blessington House (No. 10), the oldest house in the street. It was built about the year 1734, by the Rt. Hon. Thomas Carter, Master of the Rolls from 29th Dec., 1731, till 24th April, 1754, who took a lease of the plot of ground on which the house stands, from the Rt. Hon. Luke Gardiner. 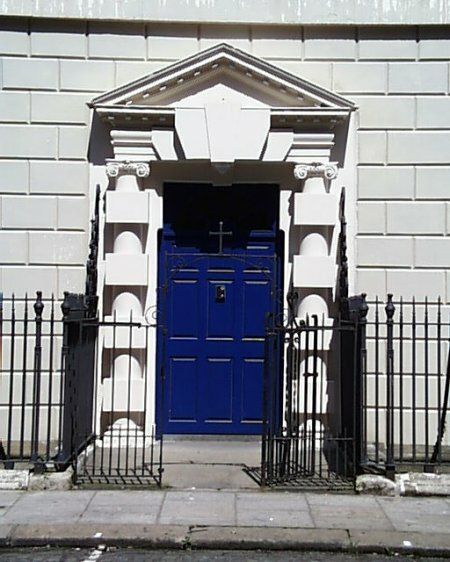 The façade of the house has no portico, but there are two fine engaged Ionic columns, and above the door an arched window with two narrower ones, members of the larger arched one, and four others—the three-ope window forming the centre. There are five windows in the upper storey, and a project ing cornice gives an architectural air to the whole façade. On entering, a fine stone staircase is at the right hand, broken into two flights, which by easy gradations lead up a landing place to the front drawing-room door, this lobby being supported by two columns making a fine feature in the hall.